The 1.7-10x42 Z6i 2nd Generation Riflescope (Matte Black) from Swarovski Optik comes with an Illuminated 4A-I Reticle in the 2nd focal plane . The close to perfect Z6i has been re-engineered into the Z6i 2nd Generation - possibly reaching optical perfection. As if the Ballistic and Parallax turrets of the Z6i weren't already close enough to being mechanically flawless, the 2nd Generation Z6i's handling has been optimized even more. Swarolight technology has been added as well, providing automatic on-off reticle illumination for an extended battery life. 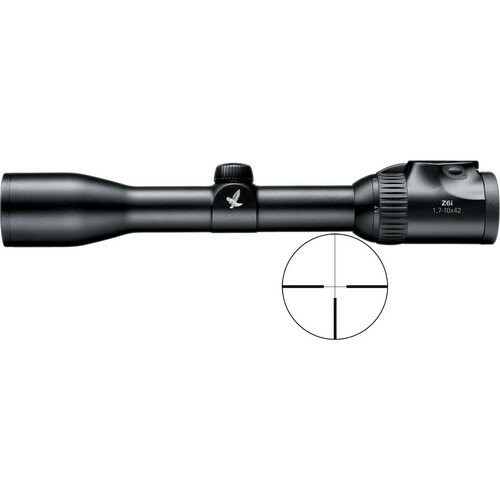 The 1.7-10x42 Z6i scope has a smooth aluminum tube that accommodates ring mounting. It is rugged and dependable with a nitrogen filled tube for fogproofing and water proof to over 13 feet. A low magnification of 1.7x is appreciated by hunters attempting to gain positive target acquisition on fast moving game. Quickly dial up to the 10x high magnification for a longer shot. From the ocular to the objective, inside and out, this scope is a world class performer that will get you on target quickly and accurately. This Z6i has a 4A-I in the second focal plane so that the reticle size stays constant even though the target size increases with the zoom magnification. It has a 30mm tube and a matte black finish. Impeccable craftsmanship, optical genius, rugged dependability, and repeatable accuracy have all been engineered into the design and construction of this fine sighting optic to ensure a lifetime of successful hunting. Second focal plane positioning of the reticle maintains its size throughout the zoom range.